Departure Day, Sunday November 4, promised to be a beautiful, crisp autumn day. 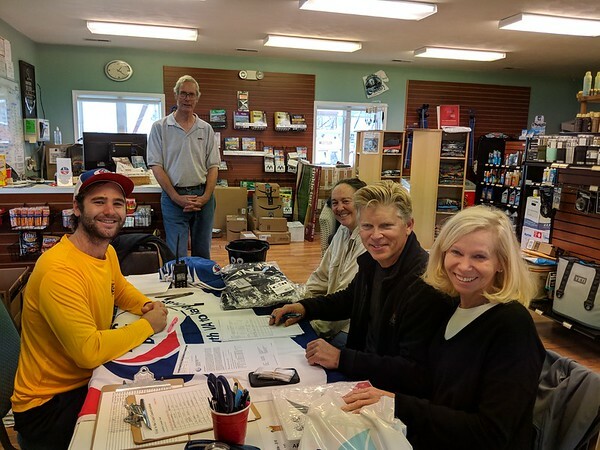 Glenn, the captain, and crew, Pam, Jason and Karen, stumbled around in the darkness, donning warm, winter gear and grabbing hot coffee to start their journey. We’d been preparing Mira and ourselves for this journey for months and were feeling ready – though, with the usual anxieties that precede a multi-day passage at sea. Lines were tossed and fenders stored and by 6 am we were off! 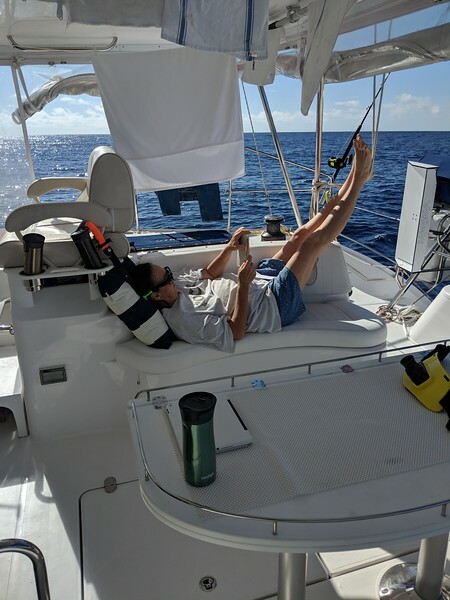 Since Mira was the only boat of 21 boats participating in the Caribbean 1500 Rally headed for Antigua (the rest headed to Tortola), we chose not to join the official start line at the mouth of the Chesapeake Bay later that morning. 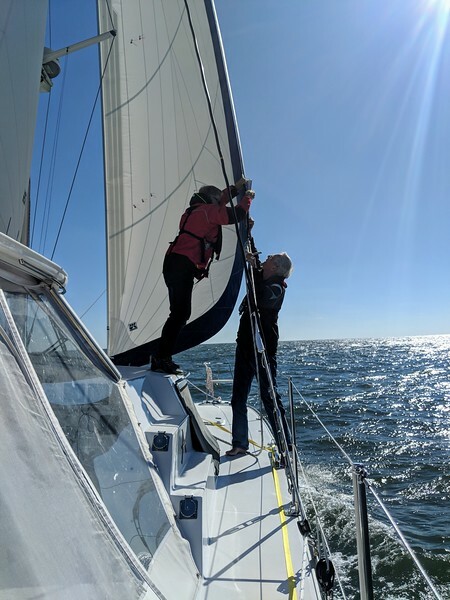 As soon as we took the turn out of the Bay heading south, the winds freshened to 20 knots slightly forward of our beam, and Mira was off! The ensuing 1745 nautical mile passage was a true ocean sailing adventure. During the next 12 days at sea Mother Nature seriously had her way with us. 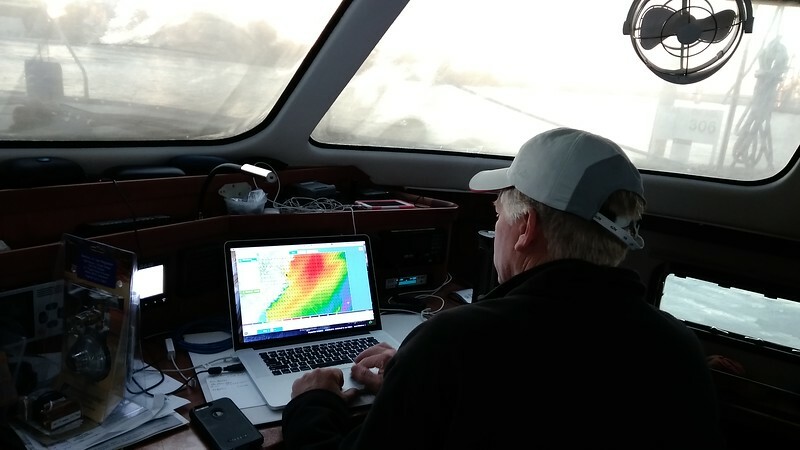 The first 24 hours of the trip were spent sailing south along the Virginia and North Carolina coasts and around Cape Hatteras as we encountered a nasty warm front. The front threw 40 knot winds, choppy Gulf Stream waves, and a 5 knot current in our face. The crew doused the head sail, centered a scrap of main and turned on both engines – trying to stabilize the boat as we doggedly pressed southward. Continuous rain and squalls added insult to injury, as we turned east at the designated coordinates for our Gulf Stream crossing. 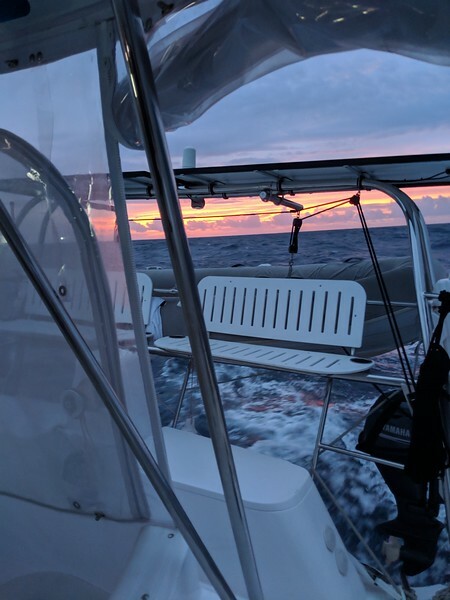 Another 24 hours later the Gulf Stream was behind us and we were exhausted but, as the air and sea temperatures noticeably rose, the crew began to sense a glimmer of the Caribbean waiting for us. The middle part of the passage had Mira continuing east into the open sea of the North Atlantic. 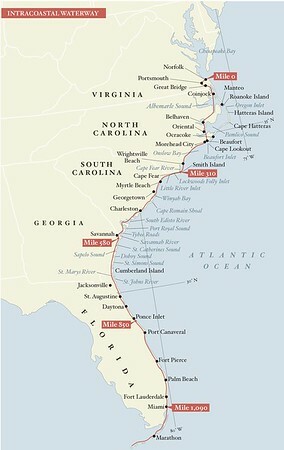 From the US east coast, the Caribbean islands are not only south but quite a bit further east than most people realize. 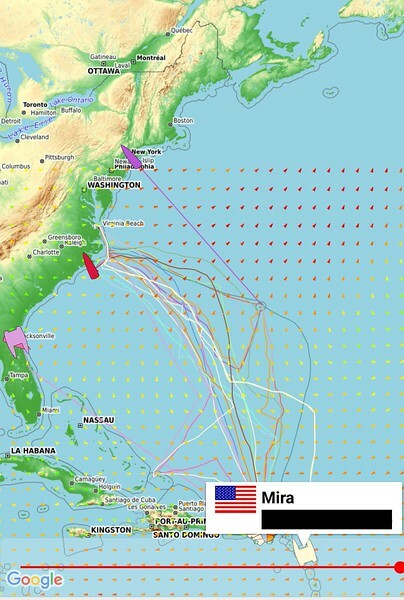 Traditionally, sailboats head eastward almost to Bermuda before turning south to catch the prevailing trade winds. In contrast, we encountered a stalled high pressure system which sucked away all of the wind we needed to sail east! 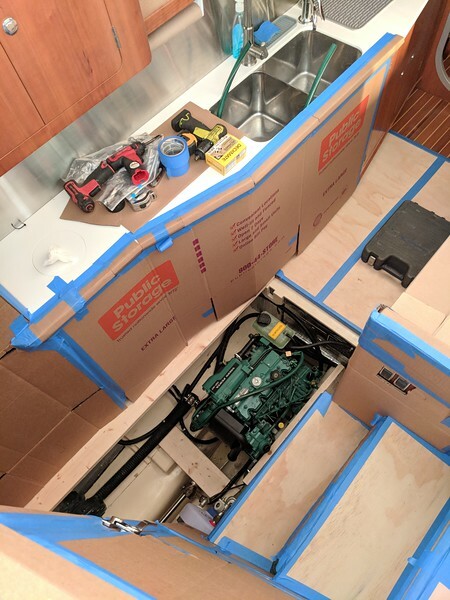 We were forced to motor for 6 days – seriously depleting our diesel stores. But …. we were wearing shorts and swimming in the 4 mile deep ocean and catching Mahi-mahi!! Skies were clear, fish were biting, stars were shooting, captain and crew were happy! Unfortunately, about this time, Mira received weather updates via our IridiumGO satellite system that alerted us to a tropical depression forming in the Leeward Islands and heading northwest directly into Mira’s path. Game-day decision time! 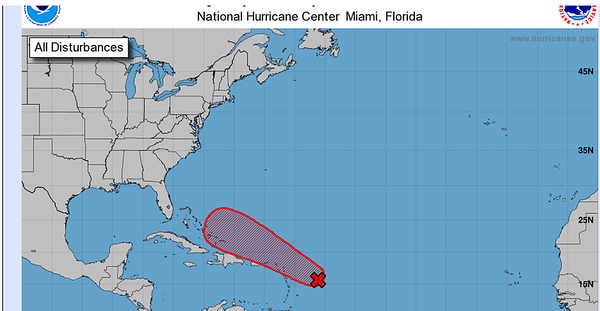 Our best option was to head a bit farther east than planned (all the way past Bermuda to the 61st longitude line) and then sail south to Antigua, hoping to come in behind the eastern edge of the tropical depression. 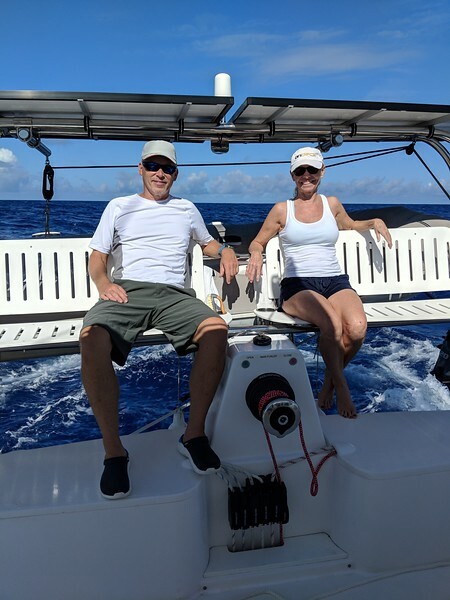 These last five days of our journey were spent sailing straight south – skirting the tropical depression…almost. Collectively, the captain and crew of Mira sailed faster and saw higher winds, waves, and more squalls than in all of Mira’s experiences. 25 knot sustained winds and 3 meter swells directly on the beam catapulted Mira southward. Waves crashed over the cockpit roof. 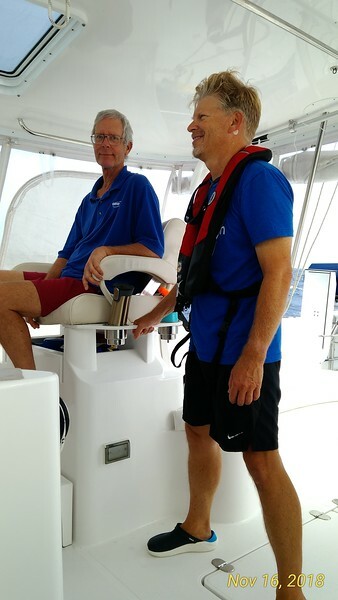 Constant squalls and confused waves took a toll on the crew. Top wind gusts recorded reached over 40 knots, and Mira’s top speed was 15.9 knots – a first for Mira. She was lurching and bucking like a bronco. Meals were limited to those eaten with a spoon from a bowl. Water usage was rationed because of low diesel stores and a stressed water maker. Mira, an Antares catamaran, is one of the best blue water sailboats in the world, but all boats have their limits. As the stormy days wore slowly on, Mira began to show symptoms of the strenuous and difficult passage. Limping into Falmouth Harbour, Antigua, with reluctant engines, we dropped anchor under sail at 10:39 am on November 16th. 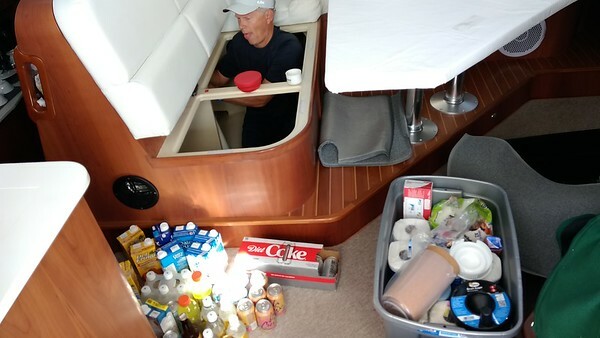 The next 14 days were spent washing, rinsing, scrubbing, repairing, adjusting, and testing all systems on the boat. The crew also took a few days of well deserved R & R before our kids were scheduled to arrive for Thanksgiving. Happily, Mira is now returned to her former glory while her crew keeps a watchful eye for another sneak attack from Mother Nature. This is the Carib 1500 Rally map that shows the track of each of the participating boats. Mira is the pale yellow track line that shoots straight east to maneuver around the storm. 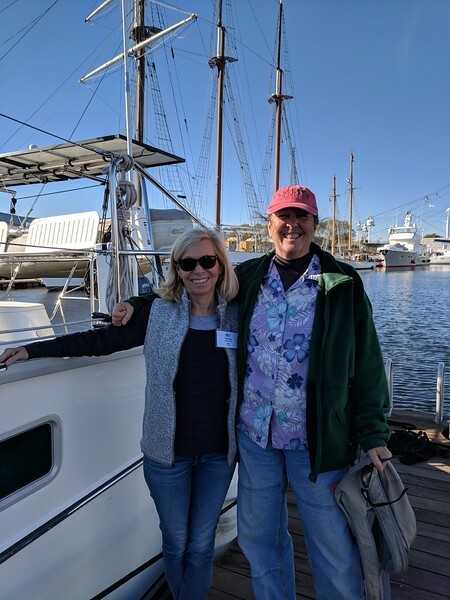 The first day of our passage – bundled up from the cold of November in Virginia. 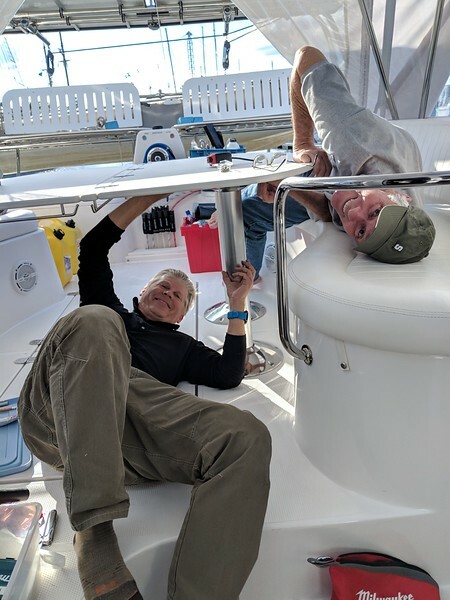 Jason giving Glenn lessons on the fine art of catamaran sail trimming. 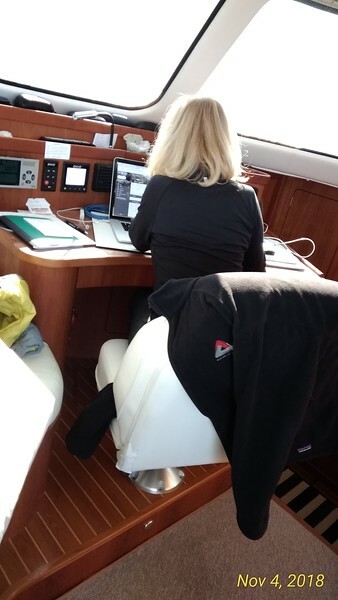 Pam at the SSB radio (single side band) taking her turn (along with 3 other boats) leading the morning and evening Carib 1500 Rally nets. 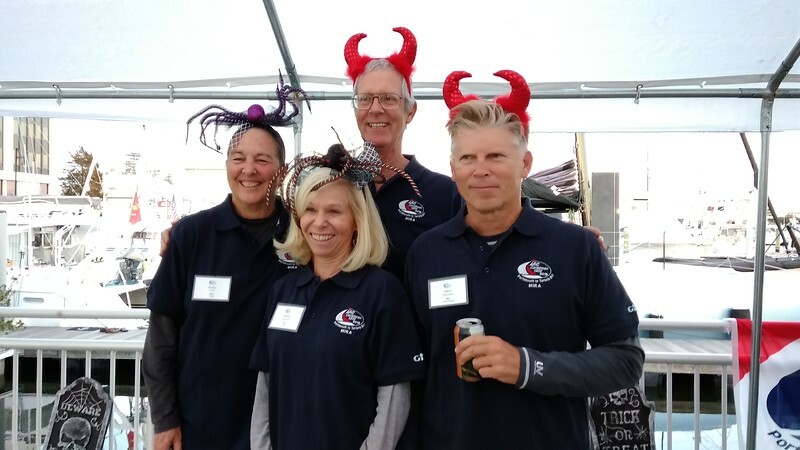 It was a great way for all of the Rally boats to connect each day and discuss safety and weather information, but also – fun things like Mahi catchings and shooting star sightings. Here are the beginnings of the churned up and confused waves of our Gulf Stream crossing. The next 24 hours became even more difficult. The nasty warm front tossed more wind, waves, and rain in our face as we battled the strong Gulf Stream current. Small, dark Atlantic dolphins greeted us after we ventured through the Gulf Stream and out into the open Atlantic Ocean. Relaxing on our favorite perch – savoring the warm temperatures and sunshine that were starting to appear. The middle part of our passage was truly delightful. Captain and all crew on Mira participated in meal preparation for this passage. We took turns with cook duty every 4th day in our watch rotation. On our “cook” day we cooked and cleaned all day and didn’t take watch until the nighttime. 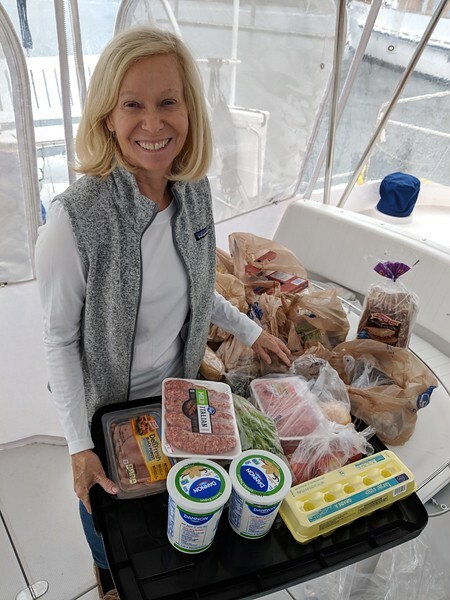 Pam enjoyed planning all of the meals, buying the ingredients and provisions, and most importantly, seeing the happy faces of the well-fed crew. 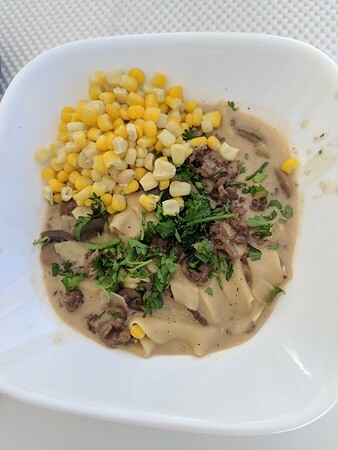 Here’s One Pot Beef Stroganoff. 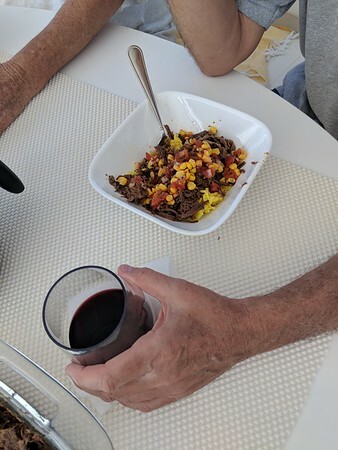 This is Barbacoa shredded beef with corn salsa on yellow rice – all prepared in the pressure cooker. 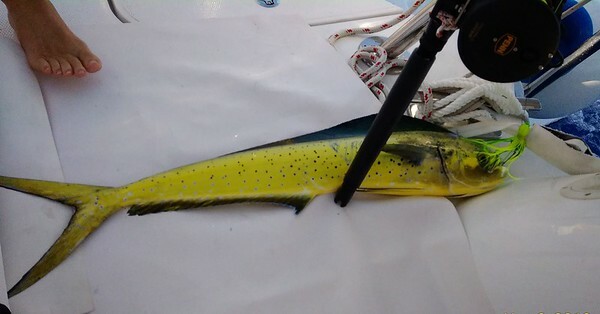 Here’s one of three beautiful and delicious Mahi-mahi we caught on the middle part of our passage. Definitely a highlight of the trip. 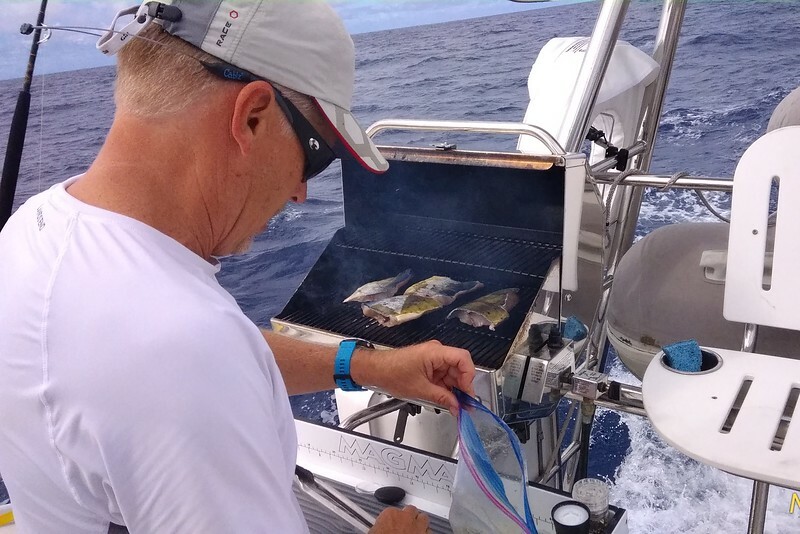 Rocking and rolling a bit, but Glenn still got the Mahi grilling done! Freshly caught grilled Mahi served with lemon garlic butter sauce. Leftovers made yummy Mahi fish tacos the next day. Captain threw out a line during one of our motoring days and we all dove in!! 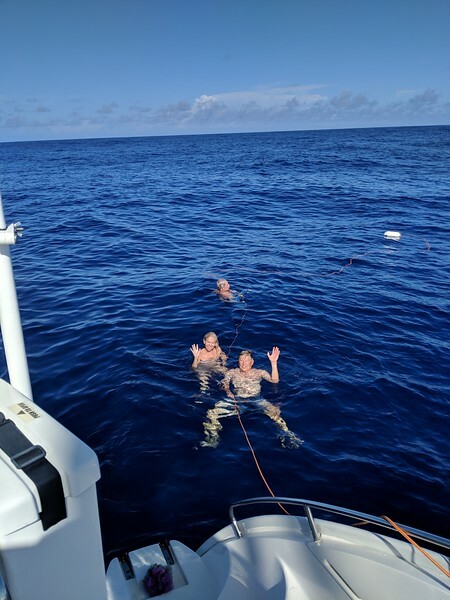 The middle of the Atlantic (latitude 26.45 longitude 62.23) that was 19,690 feet deep or 3.7 miles. Surreal experience! A beautiful sunset from Pam and Glenn’s cabin. Seas were starting to build. As Mira took her turn south on Monday, Nov 12, she was starting to skirt the edge of the tropical depression. The seas got increasingly confused and much larger, winds began to increase and squalls began appearing. The last 3 days were the most difficult of the trip. A screenshot of the tropical depression smack dab in Mira’s path. The crew of Mira practiced safe sailing precautions. All crew wore their own PFD when leaving the salon area at night and during rough seas. 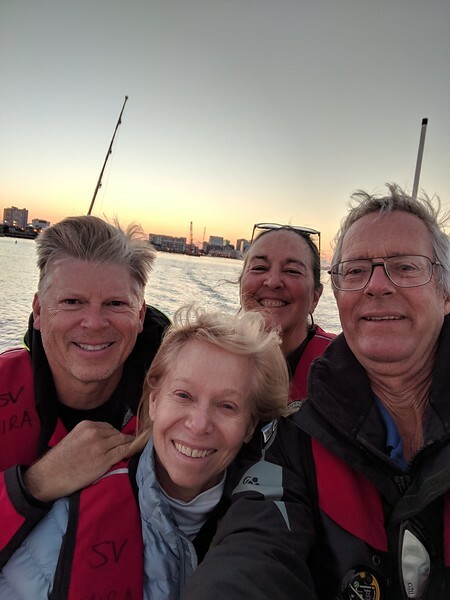 Each PFD had its own personal locator beacon that would alert Mira’s chart plotter with a GPS coordinate and Mira’s crew with a loud alarm sound – if the PFD went overboard and was deployed. 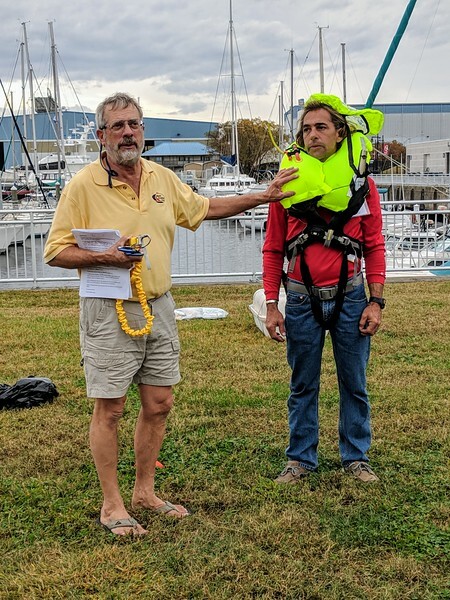 Each PFD also had a light, a knife, a face spray shield, and a whistle. Each crew member also attached their blue tether immediately upon entering the cockpit and would tether onto jack lines along either side of the boat if leaving the cockpit. 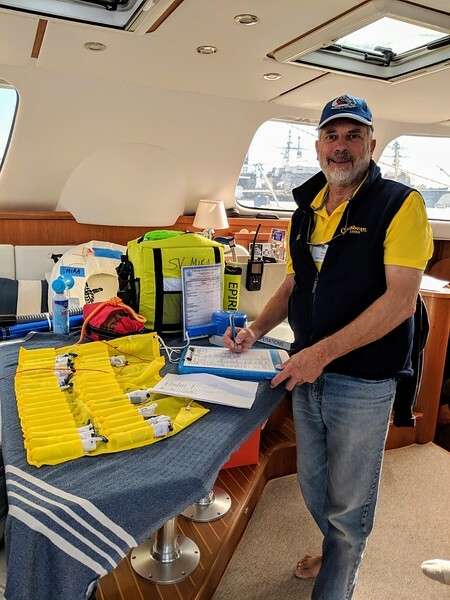 Glenn performed a deck check late every afternoon – checking all the running and standing rigging (lines and metal supports) – even in the worst of the weather. Glenn and Jason supporting each other during their difficult watches during the last few days. Land Ho! Antigua on the horizon. A sigh of relief from all! 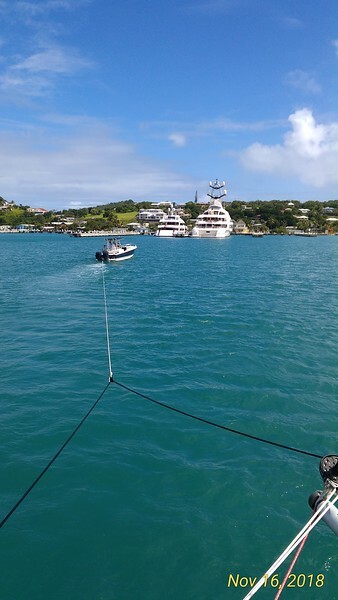 Mira’s engines needed some tender, loving care – thanks to the Antigua Yacht Club for towing us in from the outer anchorage area. 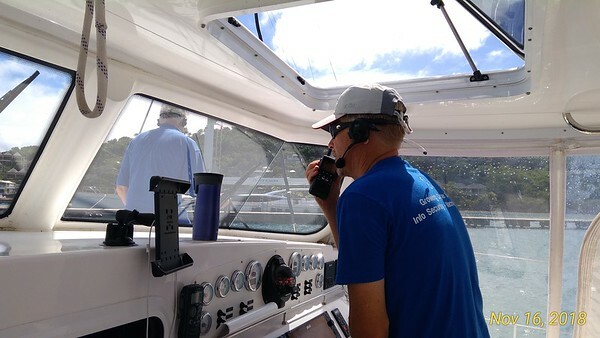 Glenn multi-tasking technology – coordinating a delicate docking operation with the tow boat and his crew. 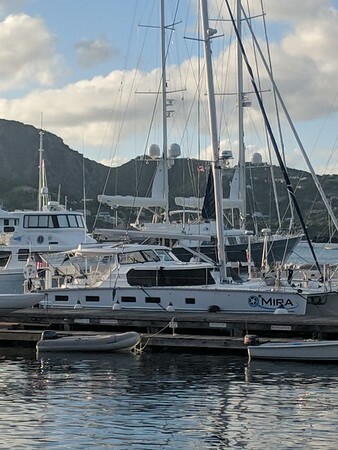 Mira at rest – finally – in the Antigua Yacht Club – twelve days later! 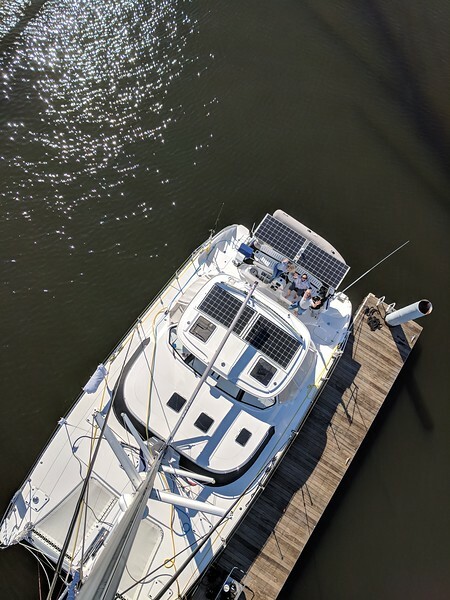 Mira was safely tucked into a marina in Brunswick, GA. After a brief hiatus in Atlanta, we returned and started making sailing plans for the summer. 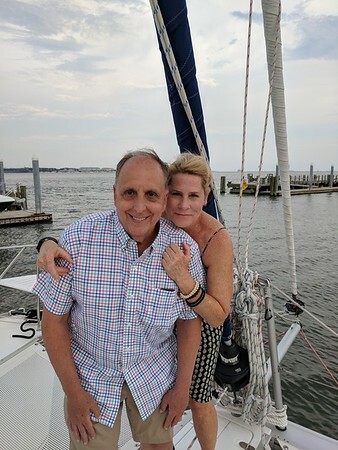 We wanted to sail up the East Coast to see family and friends along the way, to explore some new and old towns, and to get some boat upgrades done in Norfolk and Annapolis. 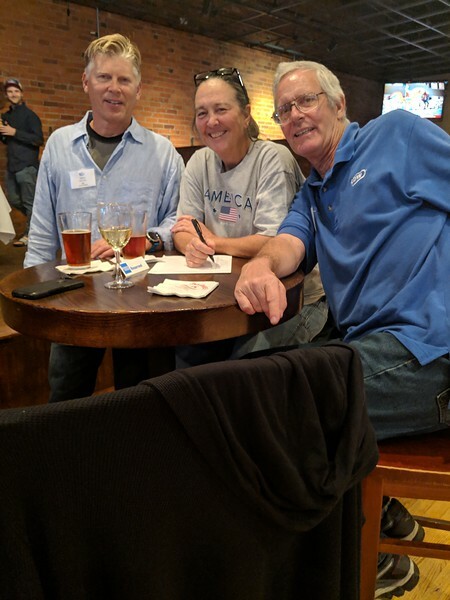 And, by the end of October, we planned to be in Portsmouth, VA, to join the Caribbean 1500 Rally. 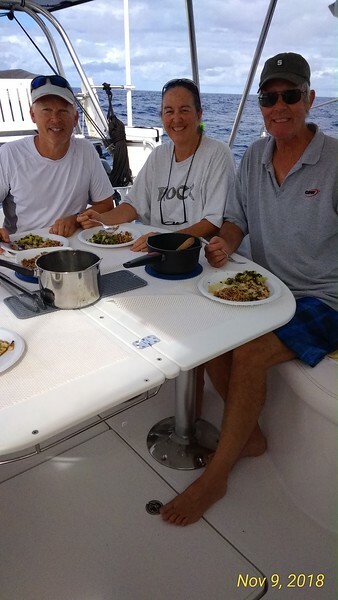 This rally sails about 30 boats nonstop offshore from Portsmouth to Tortola, BVI – about a 7 to 10 day sail. 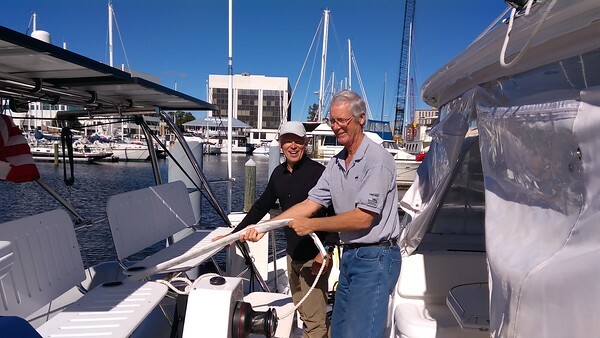 There are two ways for boaters to sail up the East Coast – “outside” or “inside”. “Outside” refers to sailing off the coast in the Atlantic Ocean. 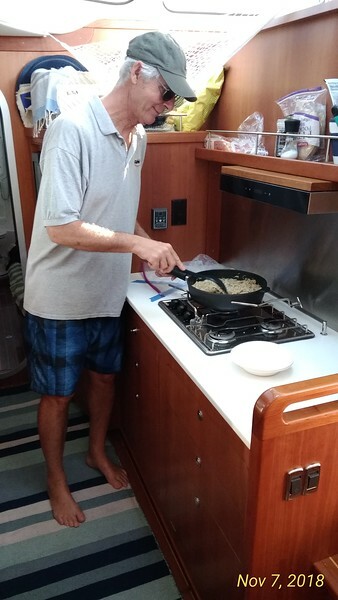 “Inside” refers to sailing along the coast in a canal called the Intracoastal Waterway. 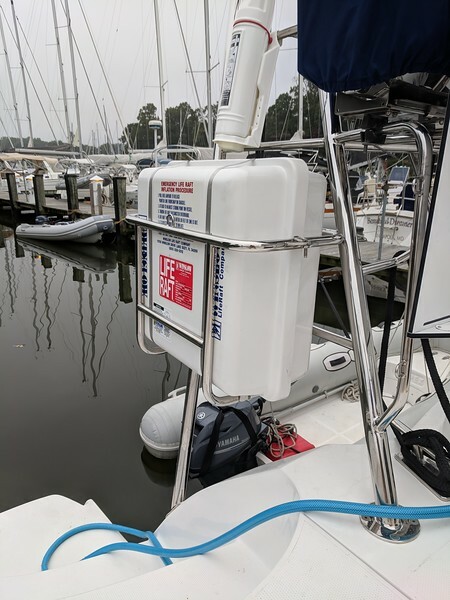 The Atlantic Intracoastal Waterway (ICW), or “The Ditch” as many refer to it, provides the boater with a continuous, and for the most part, protected passage just inside the Atlantic Coast. Beginning at mile marker (MM “0.0”) in Norfolk, VA, the Atlantic Intracoastal Waterway stretches 1,243.8 SM (1080.8 NM) south to Key West, FL. We decided to try a little bit of both. “Outside” is usually quicker, but more difficult with long overnight watches for the two of us The ICW is more scenic and protected, but with little wind, tricky depths, and fixed bridges for Mira’s tall mast to squeeze under. 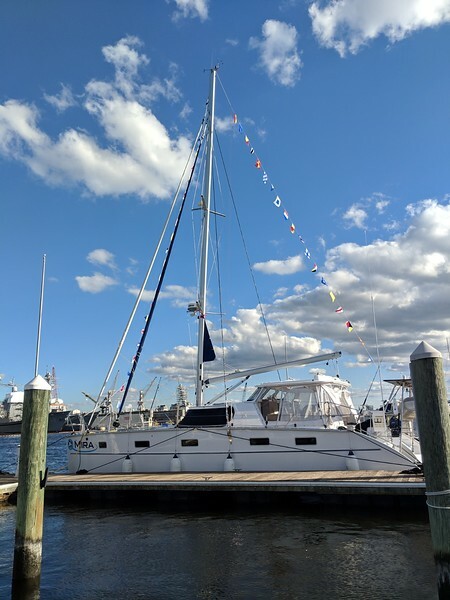 So, we made plans to sail “outside” from Brunswick GA to Charleston, SC and again “outside” to Beaufort, NC then “inside” from Beaufort, NC to Norfolk, VA then work our way north up the Chesapeake Bay to Annapolis MD. A very busy July! We have done a few non-stop overnight passages since commissioning Mira in Argentina…. 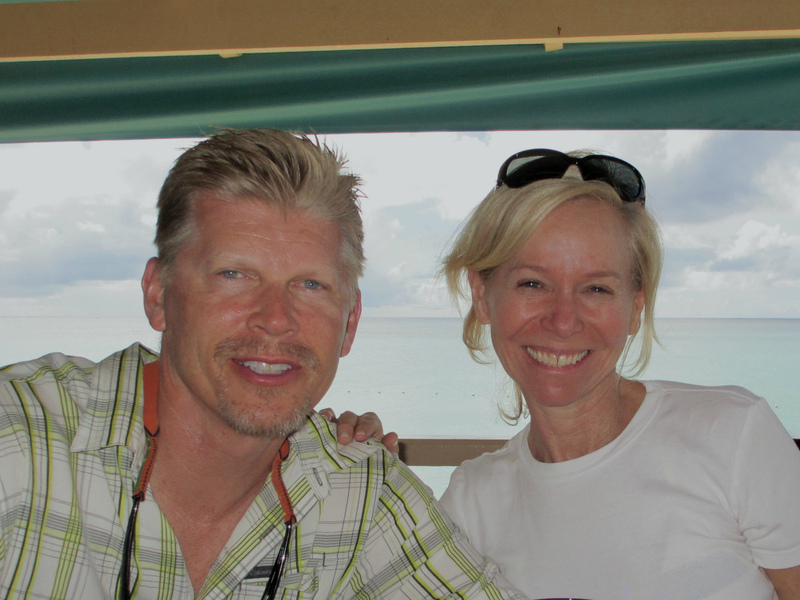 11 days from Brazil to Grenada, overnight from St. Martin to the BVI’s, and 5 days from St. Thomas to Exumas, Bahamas. Somehow Pam had managed not to have taken a single overnight watch. She was a little nervous…but, she was ready to give it a try. 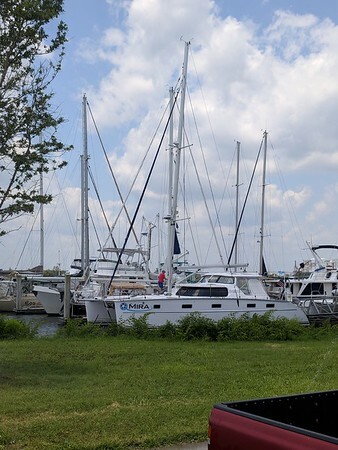 Glenn planned the sail from Brunswick GA to Charleston SC to be about 24 hours or 141 nautical miles. 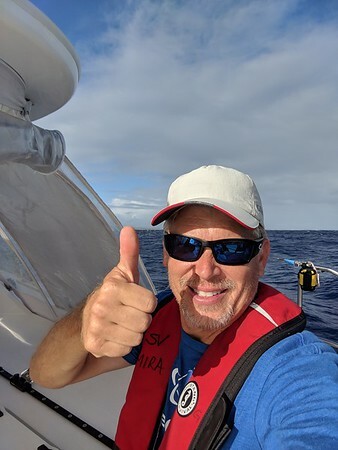 We left Brunswick about noon with light winds and motor sailing in mid-July. The plan is always to arrive into a new anchorage during daylight hours. After an early dinner, Glenn went to bed in the salon (easy access if Pam needs help) about 8 pm. Pam’s plan was to stay awake as long as possible and then switch with Glenn. Because Glenn can literally sleep anywhere and anytime on command – he got the first sleep shift! Her first nighttime watch turned out to be delightful and much easier than she thought. 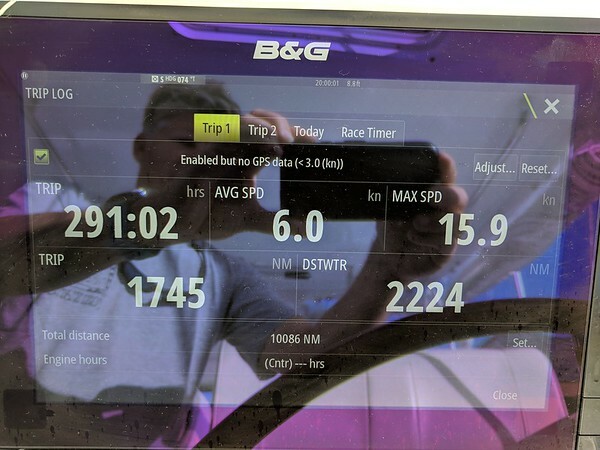 Winds were light and that really helped – not having to make sail changes in addition to watching the AIS and radar screens. 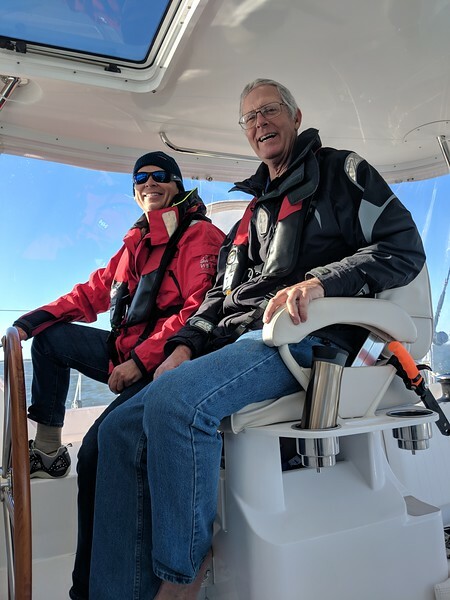 She is still getting used to all of the lights of nighttime marine traffic and gauging their distances – but, radar and AIS make it much easier. Following a huge tanker’s track in AIS and knowing that Mira won’t cross its path is reassuring! She woke Glenn about 1:30 am, and then was off to sleep until about 6 am. We arrived into Charleston Harbor around 10 a.m. and settled Mira into her new temporary home at the Charleston Maritime Center. 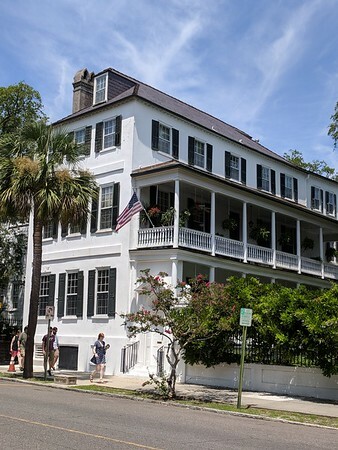 We thoroughly enjoyed exploring Charleston – both gastronomically and architecturally! 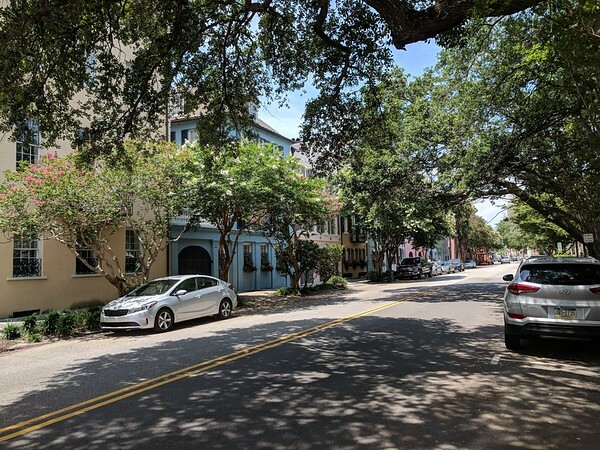 We ate, drank and rode bikes through Charleston. 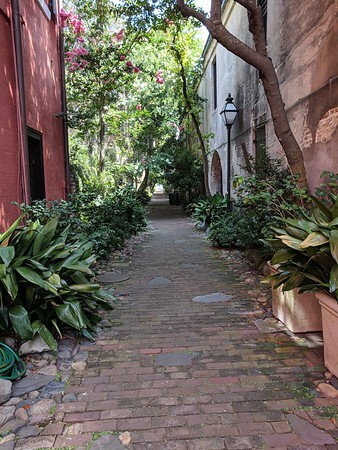 So much fun exploring all of the alleys and nooks and crannies of Charleston by bike! 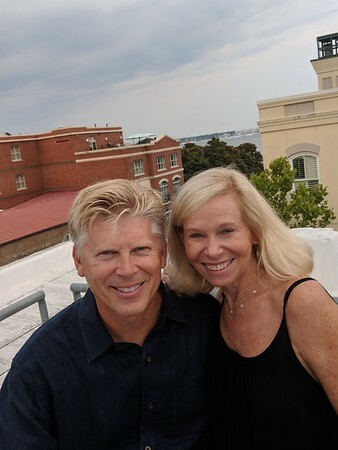 So happy Lori and Mark drove up to visit Mira and explore Charleston with us! 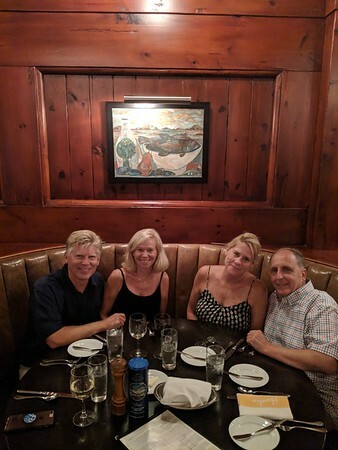 Dinner at Hank’s Seafood – I still have dreams about their delicious grouper! Drinks at The Rooftop Bar of the Vendue Hotel. 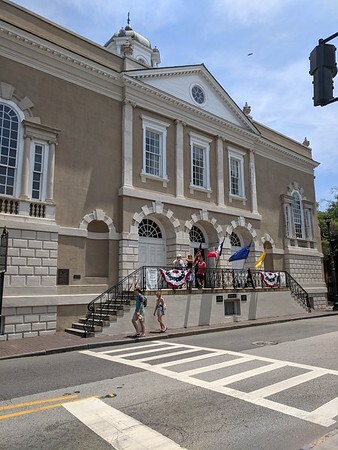 Charleston is the oldest city in South Carolina, and its history is written in brick and wood. 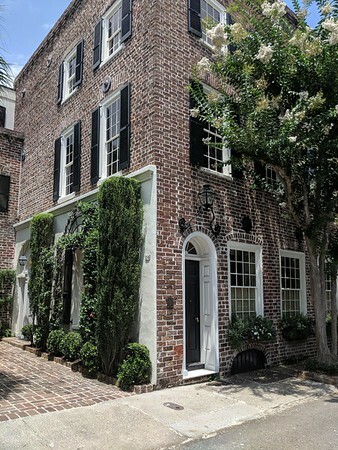 Wealthy Charlestonians traveled the world and brought back with them a desire to imitate the opulence they found abroad. The result is a city that boasts 8 different styles of architecture, from Georgian to Art Deco. 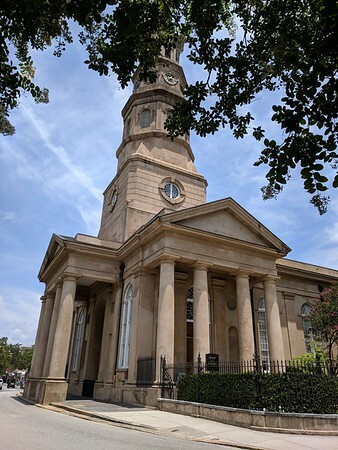 The culmination of our time spent in Charleston was used exploring some of the most beautiful areas of town on a guided walking tour. 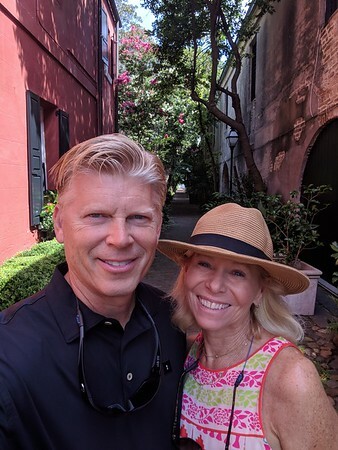 Sadly, we had to say good-bye to Charleston! Time to move on!